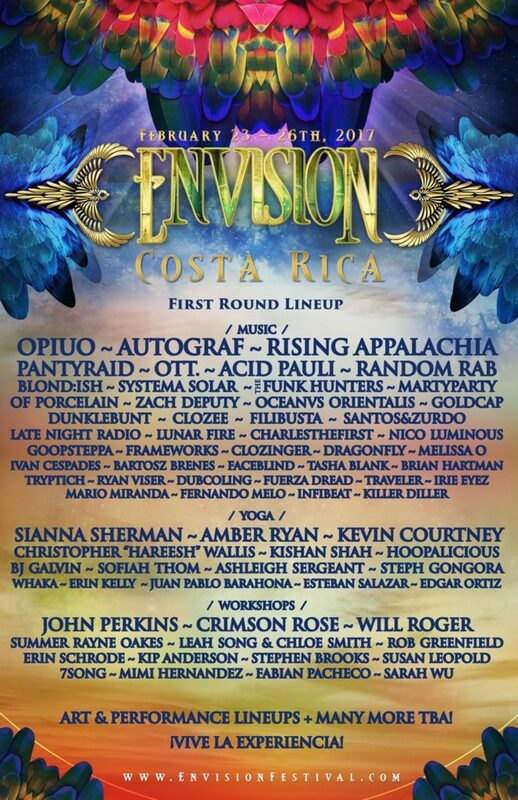 In an attempt to bridge the closing gap of our natural state as once-connected human beings with the Earth, Costa Rica’s Envision Fest functions as a gateway to our instinctive past to again be one with nature and all of its goodness. Through the power of yoga, music, dance and art, this festival provides everything we seem to be losing as we evolve and reinstalls the universal ideals of self-love, compassion and oneness. Located just outside of environmentally conscious towns of Dominical and Uvita and just two minutes from the untouched La Playa Hermosa, the magical, dewy rain forest labyrinth, Rancho la Merced, serves as the ultimate destination for such a celebration of life. Not only is veteran performer Traveler a fan of the enchantingly serene jungle setting that Costa Rica’s beautiful country provides, but more so the emotion behind the event itself as a beacon of sustainability and hope for a greater future. “Envision is one of my favorite music festivals, I am a huge supporter of the environmental sustainability and of the health and spiritually conscious mentality of the event. The promoters are great and of course I love Costa Rica,” said the instrumentally sonic emissary. As he is no stranger to the event in previous forms as both Traveler and Zander, this one-of-a-kind influencer will bring even bigger beats to the fest this year under both stage names with the highly anticipated new release, “Satisfy.” The mix is set to debut on SoundCloud in the coming week on Outside In Records, the label cofounded by Traveler and DJWINNER as a sonic repository and distribution platform for the acts in their artist collective, Outside In Movement. Traveler and Outside In have an extensive release strategy lined up for Spring and Summer 2017. These are not the only intangible displays of music and light you can expect from the now four-time welcomed artist though, as he hints at unreleased mixes dripping with sultry bass lines and stellar, racing tempos for both the event and Envision’s epic After Party. And although he can create a pretty untouchable mix, like his “All Night Long” Lionel Richie remix, every track he will bring to the tropical adventure will remain pure in its original state; some never even heard before! Set to deliver, inspire and influence throughout the entire duration of the 3-day escapade, fans are always welcome to share in the experience with Zander by saying hi or dancing with him between sets…all in ode to the very foundation of the festival’s ever growing communal morale. This entry was posted on Thursday, December 15th, 2016 at 6:19 pm and is filed under News, Shows. You can follow any responses to this entry through the RSS 2.0 feed. You can leave a response, or trackback from your own site.